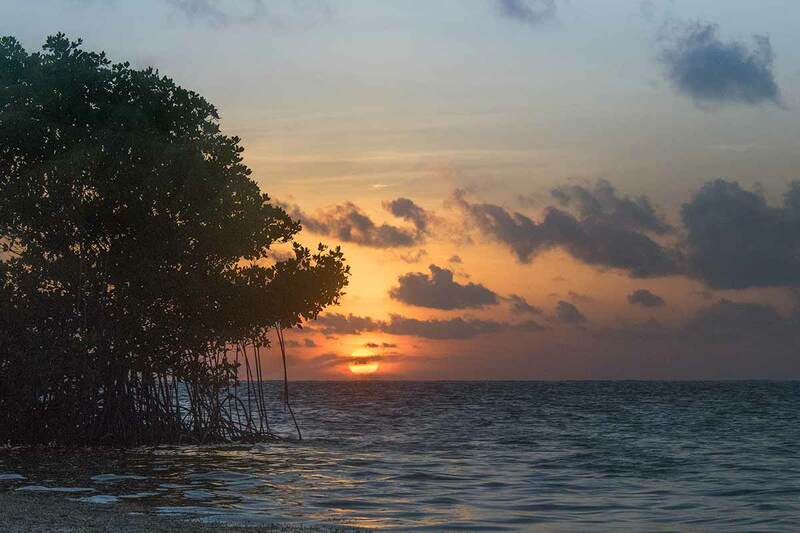 Belize NMS: Mostly fair weather will prevail today, then a tropical wave approaches tomorrow. 24-hour forecast: Mostly sunny today with isolated showers or isolated thunderstorms except for a few more south this morning and inland this afternoon. Cloudy spells tonight with a few showers and isolated thunderstorms over the south and along some coastal areas tonight. General Outlook: For Thursday and Thursday night is for a few showers and isolated thunderstorms to continue around the country. Today E 5-15 kts Choppy 3-4 ft ISOLATED SHOWERS OR ISOLATED THUNDERSTORMS. Tonight E-NE 5-15 kts Light Chop 1-3 ft A FEW SHOWERS OR ISOLATED THUNDERSTORMS SOUTH. Tomorrow E-NE 5-15 kts Light Chop 1-3 ft A FEW SHOWERS AND ISOLATED THUNDERSTORMS. Outlook E-NE 5-15 kts Light Chop 1-3 ft A FEW SHOWERS AND ISOLATED THUNDERSTORMS. An upper-level cyclonic shear axis is noted on water vapor imagery extending in NE to SW fashion from an elongated cyclonic circulation well north of the Caribbean southwestward to central Hispaniola, to near 15N76W and to central Panama. This feature is interacting with the tropical wave along 77W/78W initiating deep convection just south of central Cuba as described above under the Tropical Waves section. Otherwise, isolated showers and thunderstorms are over the remainder of the Caribbean west of 79W, while isolated showers are east of 79W. The easternmost sector of the eastern Pacific monsoon stretches along 09N/10N to across northern Panama, to the far SW Caribbean, and to northwestern Colombia. 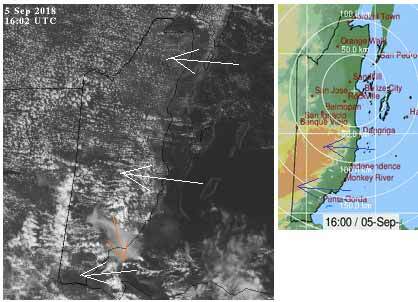 Widely scattered showers and isolated thunderstorms are seen from 09N-10N east of 81W to inland northwestern Colombia. The tropical wave along 77W/78W will move across the rest of the central Caribbean through this morning, then across the western Caribbean later on Wed and through Fri. The gradient associated with a relatively weak surface ridge, that is to the north of the region, will maintain moderate to fresh trade winds mostly everywhere, through the next several days. Another swellup, but just south of Belize, but causing rain in parts of southern Toledo. There is also chunky easterly Caribbean cloud coming in over most of south Belize, also causing a few scattered showers. Most of central and north Belize is in sunshine, with just a little thin high level cloud from the NNW. Easterly Caribbean thin lines of cloud, just starting to develop over land. 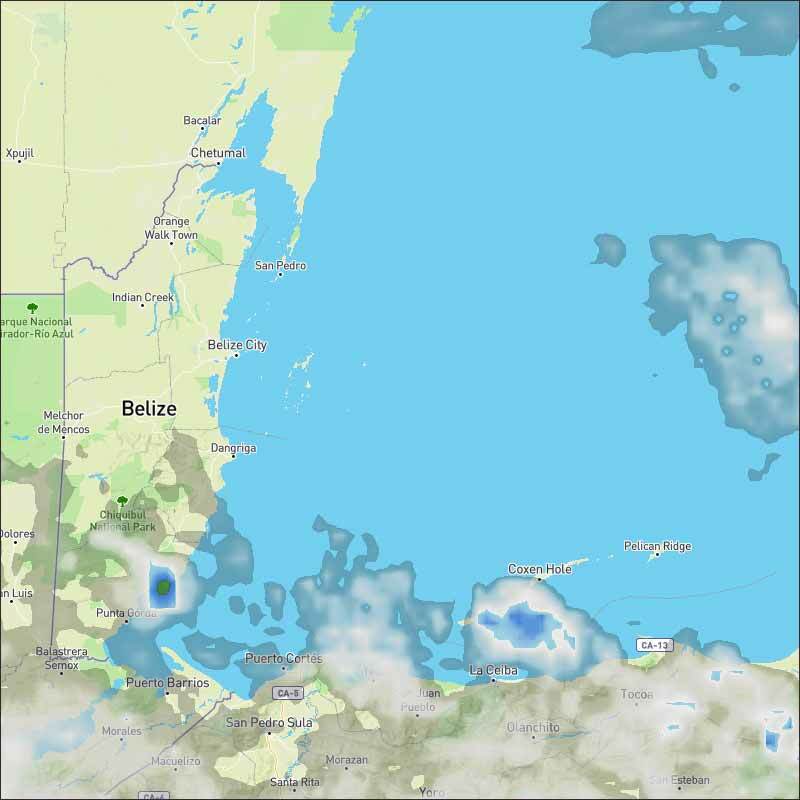 Looks like today will be mainly sunny, with clouds developing this morning, small chance of rain in central north Belize, significant chance of rain in southern Belize. On Ambergris Caye this morning the wind is from the East at 10 mph and the sea around our barrier reef is calm. Looks like a beautiful day ahead with a high temperature of 90 f.